The Queen of Swords is an archetype of an older, wiser feminine intellect. She could be thought of as the most masculine of the all the queens, and may come off as quite stern and emotionless. This card represents the importance of making judgments without relying on emotion alone. 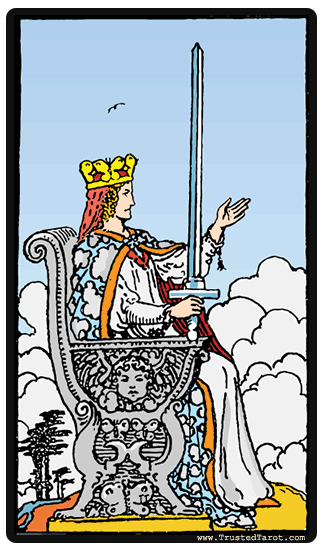 The Queen of Swords beckons you to look at all the facts before making a decision. This queen does have compassion, which is why she has her hand reaching outwards in offering, but she wants to connect to people using an understanding that is intellectual. This card represents the importance of making judgments without relying on emotion alone. The Queen of Swords beckons you to look at all the facts before making a decision. This card also means that you will need to become independent with your judgments. You must rely on the unbiased intelligence, which has you researching alternative viewpoints and thinking carefully on your decision. Compassion and empathy in these cases can distract you from your task, so you need you are trying to keep a strong objective view while avoiding getting emotions involved. The Queen of Swords can also be about the way that we speak with others. This queen has the ability to tell people the way it is. This allows her to get her point across, so there is no confusion about what is being said. Above all, truth is important to her, so she feels no need to soften her comments, thoughts, or opinions. She also expects the same frankness from other people, so this means that you need to be clear with everything that is being said, even if it may hurt. The Queen of Swords reversed meaning is that you may be thinking too much with your heart, and you are becoming too emotionally involved with your current situation. You have to start thinking more objectively, because your emotions could lead you astray. Take the time to look at the situation using various facts and use your head to create a clearer picture of what is really going on. Only then, can you decide what your next move should be. When reversed, the Queen of Swords can also be quite bitter, coldhearted, or resentful. You may have started to isolate yourself for a number of reasons, but the outside world could be taking this in the wrong way. You may have some explaining to do, especially if your relationships end up being stressed by your desire for solitude.